The visit to the new San Mamés stadium didn't go well for Real Madrid, who not only failed to rescue a single point from Bilbao, but also ended up delivering a very poor performance. The league lead is now compromised, since a Barcelona win this Sunday morning will mean that Luis Enrique's men will take the first place in the standings. Tonight, the 2014-2015 Real Madrid season, which has admittedly been on the rails for the past few months, finally started to reveal real cracks in the foundation. 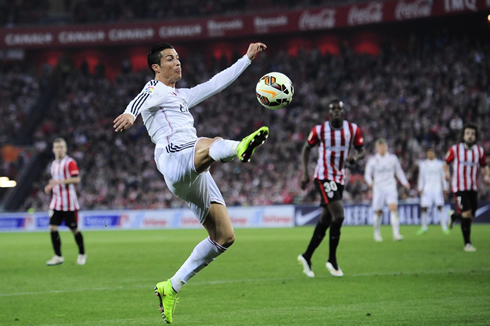 A spirited Athletic Bilbao side, bolstered by their frenetic supporters, pulled off their most impressive win of the season, in part due to an Aritz Aduriz header in the 26th minute, as that proved to be all they needed to hand Carlo Ancelotti's squad their 5th loss of the season. Despite having had most of the ball possession throughout the game, the Merengues never really looked comfortable tonight and never got to connect as they used us to in attacking front. 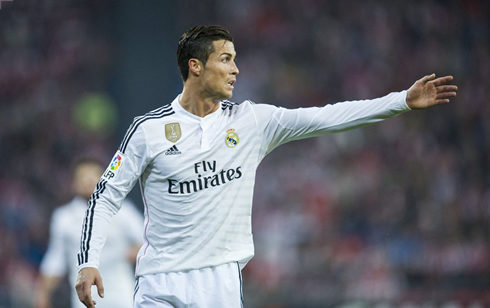 Cristiano Ronaldo, just like the rest of his teammates, were ineffective all night long. The direct consequence from tonight's display was a 1-0 loss against Athletic and seeing La Liga's leadership endangered of being handed to Barcelona this Sunday morning. When the two teams met a few months ago it was an entirely different story. At the time, Bilbao were falling apart... A rough start to the season was soon turning into a disaster and many were calling for Ernesto Valverde's head. Back then, they were absolutely slaughtered 5-0 by a high flying Real Madrid side. Tonight however, Real Madrid never looked like scoring. A truly uninspired performance now leave the Merengues in serious danger of being supplanted at the top of the table, as all it takes for that to happen is that Barcelona doesn't slip in their away fixture against Rayo Vallecano tomorrow morning. 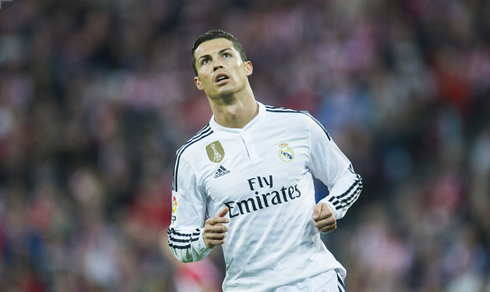 For the next 65 minutes, Real Madrid would keep banging on the door, but they would continuously fall short. The beginning of the second half looked extremely promising, as the reigning European champions seemed to realize what as at stake... 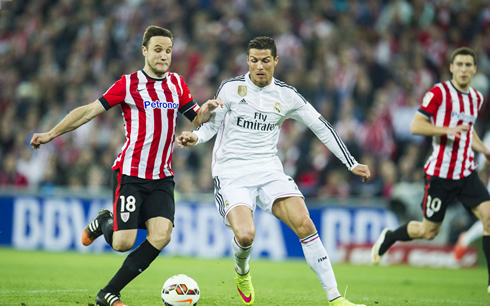 But with each clearance and defensive stop, Athletic Bilbao grew stronger and more confident. A speculative effort from Gareth Bale would hit the post later on, but apart from some brief flurries, Real Madrid never truly posed a threat to the Athletic Bilbao goal. The last time the Merengues had been shut down offensively was in the Vicente Calderón precisely a month ago, when Atletico handed Ancelotti his most painful loss since he got to Madrid, a 4-0 beatdown. 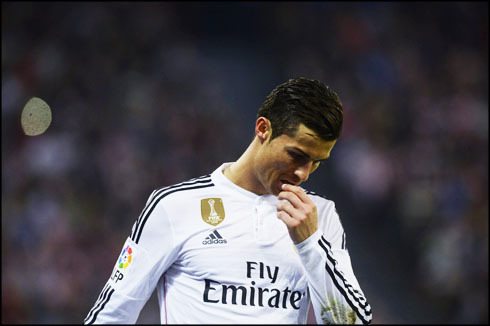 It's been a bad run of form for a Madrid team that's really found themselves waning at the worst possible time. The squad looks exhausted and completely devoid of creativity and inspiration. To the fans, the long awaited return of Luka Modric and Sergio Ramos couldn't come any sooner. The El Clasico is getting closer by the day, with an always electrifying Barcelona vs Real Madrid clash scheduled for later this month, on March 22. 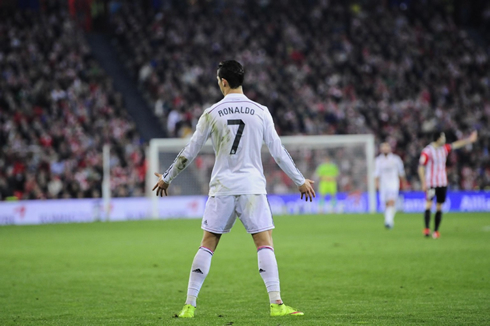 Cristiano Ronaldo next game will be for the UEFA Champions League against Schalke 04, on the 10th of March of 2015. You can watch Juventus live stream, Real Madrid vs Schalke 04, Barcelona vs Rayo Vallecano, Liverpool vs Blackburn Rovers, Napoli vs Inter Milan, and Koln vs Eintracht Frankfurt, all matches provided from our live stream section.